Sour Dough Bread - Wholly Delish! Who doesn’t love bread? I know I do! There’s something really special about Sour Dough bread in particular – it’s partly the look of a that rustic brown crusty loaf, partly the distinct flavour and partly it’s the very idea of making something so wonderful out of just three of the humblest ingredients around. Sour Dough bread is, afterall, simply flour, water and a bit of salt….with the addition of the most important ingredients of all: love and time. This month is the third time I’ve attempted Sour Dough beginning with making my own starter. After two failed attempts, I finally found a recipe that specified using only glass or plastic containers – bah! I had used a metal bowl in both previous goes! Once I was using the right kind of vessel – I chose an extra large mason jar making starter was actually a breeze! (The mason jar has the advantage of accommodating a cloth with rubberband top when I’m growing the starter on the counter as well as having a nice lid for when I’m storing the starter in the fridge). I used the instructions provided in wonderful detail at The Kitchn blog. Basically I mixed 3/4 cup + 2 tbsp of all purpose flour with 1/2 cup of water, covered with a cloth and left on the counter for a day. I then fed the starter with the same ratio of flour and water each day, dumping half of the existing starter before adding the new. Ultimately I discovered that the extra 2 tbsp was superfluous and made the process easier by just using 3/4 cup flour to 1/2 cup water and I’m not even too exact about that – I use just one 3/4 cup measure and eyeball the half cup. After five days I had a really healthy live starter to begin the process of making bread. Making the bread is a two day process in which I feed the starter Day 1 morning, mix up the dough Day 1 evening then rest the dough overnight and then bake sometime on Day 2. The process I’ve settled on definitely less finicky than some of the recipes I’ve read and I’m grateful for the advice of a good friend who had done a ton of research and trial and error in developing her Sour Dough routine. 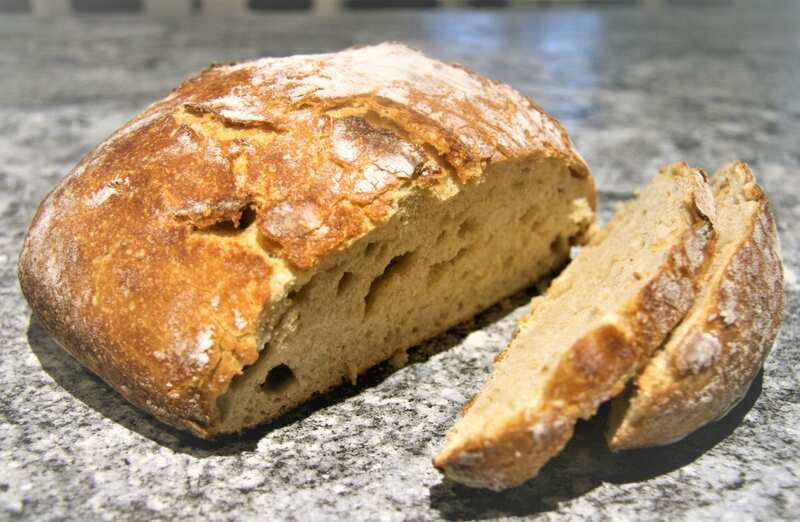 The recipe here is a manageable routine that Botha flows nicely with my day, allows me to bake bread everyday if need be and results in a delicious, crusty and airy Sour Dough loaf. I realize it sounds ludicrous to be baking these everyday – but with a family of five, a fairly consistent stream of family and friends dining with us on weekends and the sheer addictiveness of this Sour Dough, it’s really not! I also really enjoy making this Sour Dough bread. I’m finding it to be uniquely satisfying and lovely bit of mindfulness in my (nearly) everyday. I hope it brings some happiness and satisfaction to you too! Mix flour and water in a large (ideally 2L) glass or plastic container. Cover with a tea towel and let sit at room temperature for 1 day. On day 2 add the same quantities of flour and water to ‘feed’ the starter and mix well. Cover with a towel and let sit at room temperature for 1 day. On days 3-5, dump half of the starter and again add the flour and water, mix well and let sit at room temperature. On day five you should have a nice bubbly and sour smelling live starter! If you plan to use within two days simply leave out at room temperature, dumping (as necessary to prevent overflowing) and feeding each day. For use at a later date, cover with a lid and store in the fridge, removing to dump and feed once a week (let sit out one day after feeding before returning to the fridge). Add 1 1/4 cups water to a large bowl. Add 3/4 cup starter (if it floats you know it’s a good healthy starter!) and mix thoroughly. In a medium bowl add 3 1/2 cups flour and 2 tsps salt. Stir to combine. Add the flour to the water and starter stirring with a spoon as you go. Once all flour is incorporated, use hands to gently bring dough together so that very little flour is visible on the outside. Dough should be fairly dry. Cover with a tea towel and leave at room temperature for 12+ hours. Place Dutch oven (or any other deep baking dish with lid) into oven and pre-heat to 450. Meanwhile, turn dough out onto a lightly floured surface and knead once or twice until smooth. Gently shape into a ball leaving seam side down. Remove dish from oven and pick up dough round and drop into baking dish. Using a serrated knife, carefully make a shallow slice down the top of the dough. Remove lid and bake for 15 additional minutes until brown. Remove bread from baking dish, cool on a rack and then do your best not to gobble up the whole loaf! One Response to "Sour Dough Bread"